Manual Fulfillment is a setting for Merchants who are accepting payment methods from customers that require time to clear (ex: visa check card or gift cards). To see the process of manually requesting fulfillment for each order please refer to this short video. Requesting fulfillment for these orders will be required before we can proceed. Keep in mind, once you have requested fulfillment we will change the order status to "Payment Issue". This is to inform you that we have not yet approved/verified the address or payment information, therefore have not charged you. The Viralstyle Fulfillment billing cycle is at 6AM & 6PM EDT every day. Once we have approved/verified the customer address and your payment method, the status will immediately change; moving the order back into the "All Orders" tab. This will confirm that we have accepted the new/updated address & will continue with production immediately. This process is automated, you should not need to take any further action if the address & payment information is valid. This setting is for ALL orders. 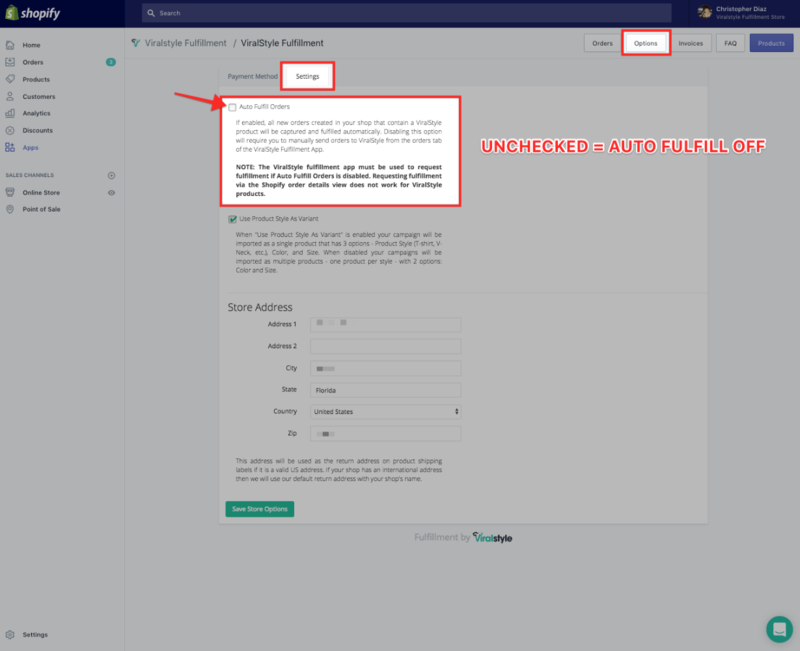 If the box is unchecked you'll need to manually request fulfillment for all orders from that point forward, until you decide to check in back ON.